The nuclear-powered ballistic missile submarine (SSBN) Vladimir Monomakh has finally joined Russia’s Pacific Fleet this month, the Russian Ministry of Defense announced on September 26. “The submarine force of the Pacific Fleet has been reinforced by the newest strategic nuclear-powered submarine of project 955 The Vladimir Monomakh. The submarine has completed its voyage from the Northern Fleet to the Pacific Fleet to arrive at the permanent base Viliuchinsk, in the Kamchakta Peninsula,” according to a defense ministry press release cited by TASS news agency. The Vladimir Monomakh is the third ship of Russia’s new Project 955 Borei-class (“North Wind”) aka Dolgorukiy-class of nuclear-powered ballistic missile submarines, designed by Rubin Marine Equipment Design Bureau and built by Northern Machine Building Enterprise in the port city of Severodvinsk. Construction of the submarine began in 2006 and it was handed over to the Russian Navy at the end of 2014. The Russian Pacific Fleet currently operates already one Borei-class SSBN, the Alexander Nevsky, which arrived in the Pacific in 2015. Two (some sources say four) more Borei-class SSBN’s will join Russian naval forces in the country’s Far East before 2020 including an improved variant of the Borei-class, the Knyaz Vladimir, designated Project 955A Borei II, although delays can be expected. Each Borei-class SSBN can carry from 12 to 16 Bulava (RSM-56) intercontinental ballistic missiles (ICBM)–a sea-based variant of the Topol-M SS-27–armed with 6-10 warheads per missile. Consequently, one submarine can carry between 72 to 160 hypersonic, independently maneuverable warheads, yielding 100-150 kilotons apiece. The Bulava missile purportedly has range of over 8,300 kilometers (5,157 miles) and is specifically designed to evade Western ballistic missile defense shields. The new ICBM is intended to be the cornerstone of the sea-based component of Russia’s nuclear triad. 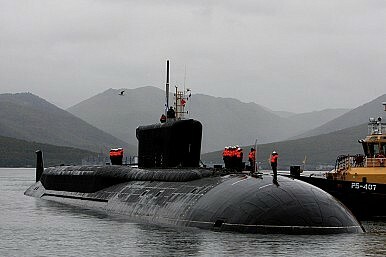 The Vladimir Monomakh is now permanently based at the Rybachiy Nuclear Submarine Base in Viliuchinsk on the Kamchatka Peninsula. Rybachiy is home to the majority of Russia’s submarine fleet in the Pacific.